that he was going to take a long-needed vacation to brainstorm some ideas for how to revive the once-dominant website that had fallen on hard times. Less than a year later, Timberlake posted a two-minute teaser video on Twitter Monday that has gotten the digiterati buzzing about how Myspace 2.0 might just kick start a site that had fallen way behind leading social network behemoth Facebook. The video opens with the simple headline, "This is MySpace," quickly segueing into a blitz through the (presumably) fake profile of one David Croft. With an interface that looks a bit like Facebook-meets-Instagram, with hints of Pinterest and Windows 8, we watch as Croft clicks through his photos and then his "Mixes," which include a series of playlists organized under such headings as songs with rain in the title, songs to play while you're downtown and a list with just cover tunes. The "Jake's Housewarming" playlist, for instance, features songs by M.I.A., Lykke Li, Daft Punk and the Cure, along with a gallery of photos from the event. The "Connections" tab takes you to a photo gallery of your Myspace friends, with, ahem, a big photo of Timberlake and a plug for his new movie, "Trouble With The Curve." The "Trending" tab lets you explore everything from bands performing on late night shows that evening to artist profiles and magazine articles. The focus on every page is lots of imagery, easy drag-and-drop interactivity and simple ways to connect with other creative people who share similar interests. The demo of the beta site also shows how users can grab a song they find on another person's page and drop it into one of their mixes and check on, say, Timberlake's personal page to see how closely your music and activity affinity match up to the superstar investor's tastes. 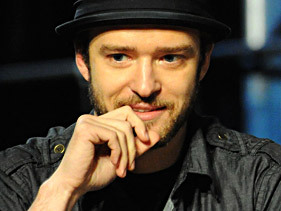 After a click through Timberlake's celebrity friend list, you are whisked off to the "Top Fans" area, where you can see where in the world your most ardent admirers/followers are, what percentage are male/female, what their average age is and who the most "influential" fan on your roster is. Speaking to the Hollywood Reporter about the revamp, Timberlake said that while he comes from a generation of artists who use social networking tools by necessity rather than choice, he is definitely won over by the medium. "But with every obstacle comes an opportunity and I see this, as it speaks to somebody like me, as bridging the gap," he said. "It's just bringing the connection that much closer while still making the artist feel comfortable that they can make their art, lock themselves in a room and torture themselves as they do, and still find a way to comfortably connect with their fan base." Timberlake said he will obviously be out front when it comes to promoting the brand and convincing his celebrity friends to join, even though he wouldn't name any names yet. "For me, to reach out to the ones that I know, I think for now to be a beta tester, as well," he said. "I want them to feel a sense of comfortable anonymity to that." One of the site's owners, Tim Vanderhook, said the new Myspace is, in essence, "a social network for the creative community to connect to their fans." He promised to go after artists, known and not-so-known, with the initial roll-out targeted at bold faced names, and later efforts focused on undiscovered talent and music fans. One of the ways to integrate fans is through a feature that allows them to be profiled on their favorite artists' page. So, if for instance, you are a huge Timberlake fan, you may get a chance to have your face an profile listed as his #1 admirer. For now, there is no timetable on when the public site will launch.